The Bangkok Kitchen is an unassuming sort of place. It has lace curtains, posters of Thailand’s tourist sights, others advertising the national beer, Singha, woodcuts on white stucco walls, a few dolls of the mythological creatures featured in the epic Ramakien story, masks and peacock feathers. You would not guess this restaurant produces absolutely first rate Thai cuisine that would satisfy the most discerning visiting Thai. It delighted the taste buds of this ex-resident of the Land of Smiles and his party. Dinner Gong lived in Thailand for five years and knows Thai food. The Chieng Rai style cookery, from northwestern Thailand, prompted paeans of praise from DG and his friends, both of whom had also visited the country several times and tasted its delicious food. We had Thai style Hot and Sour Roasted Beef Salad. The dark rich tasting meat was offset by mint and lemon grass. 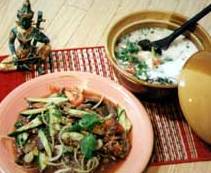 Simple yet exquisite combinations of flavors epitomize Thai cooking. The four basic tastes: hot, sour, sweet and salty are endlessly reworked in combinations of meat, seafood, noodles, rice dishes and soups. Enough people around the world like them that Thai cooking is indisputably becoming one of the world’s great cuisines. Next we had Tom Kha Koong, a shrimp soup with galangal and coconut milk and lemongrass. Coconut milk is one of the great staples of Thai cooking, along with lemongrass, a deliciously refreshing herb, used in many of the soups and dry dishes. Pad Pha Naeng Gai blended stir-fried curried chicken with more of that coconut milk. The coconut milk is a sort of cooling agent, damping down to some extent the fiery Thai love affair with chilies. The liquid dishes were served in monster sized ceramic tureens and it seemed a crime to leave any drop unswallowed. Yet DG and his friends were sated well before the last ladleful. The rice, with its faintly scented aroma and satisfying grain separation is an interesting contrast to Japanese rice. Individual portions of all dishes at the Bangkok Kitchen are modestly priced at $5 to $10 or Y500 to Y1000. There are fifteen dishes on the menu, not counting the special and vegetarian menus. They include Hot and Sour Octopus Salad, Green Curry Chicken, Pad Phed Gai (Stir Fried Red Curry Chicken), Pad Woon Sen (Fried Vermicelli with Shrimp, Eggs and Chicken), Stir Fried Curry Beef with or without Coconut Milk. The restaurant has a stage and the daughters of its owner, Tassarin Nemeth, perform traditional Thai music and dance while guests eat. The eldest Duangnapa, whose name means Clear Sky, plays a zither-like instrument, the Samiseng. Her sister Puthisa -“Well Trained Lady” - dances and so does Orawan – “Pretty One from Noble Family with Nice Skin”. They dance in both the northern and central Thai styles and include the Golden Nails dance in their repertoire. Mrs Nemeth is planning to re-open Bangkok Kitchen as soon as she can find a suitable location, preferably near Gate 2. She needs somewhere with parking space and would like anyone who knows of suitable premises to contact her. Meanwhile,she would like to thank her previous loyal customers, who of course can still enjoy her cooking before the restaurant reopens. On Saturday April 29th Bangkok Kitchen will have a farewell party with an All You Can Eat Buffet for Y1,500, including dance performances. As the restaurant seats no more than 30 to 40, anyone wanting tickets for this event are advised to book early. To get to Bangkok Kitchen take the Okinawa Expressway north. Get off at the Kin Exit and take a left. Continue a mile or so and Bangkok Kitchen is on the left. There is parking space behind the restaurant.